The U.S. student housing market is on track to add about as many beds in 2019 as it did in 2018. But which universities are receiving the bulk of the new supply is shifting. 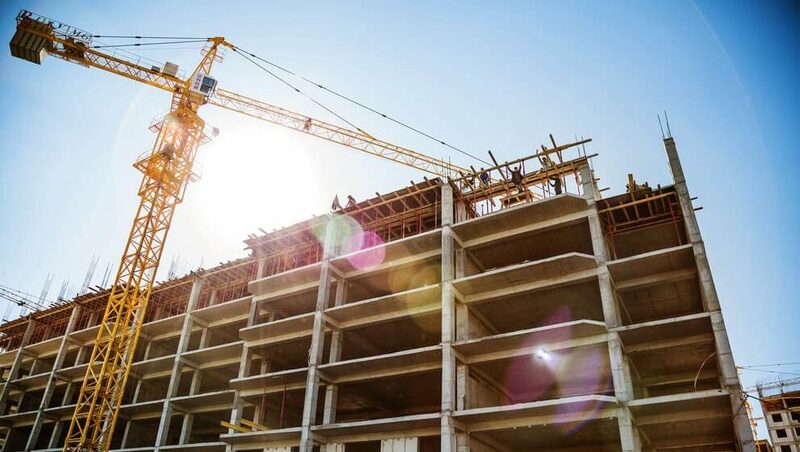 Developers are set to deliver roughly 47,000 new beds to universities around the nation this year. That’s up slightly from the 43,000-bed total in 2018 . In 2018, we saw some familiar faces at the top of the leaderboard for new beds. Florida State University, Texas A&M University, the University of Central Florida and the University of Texas at Austin were within the nation’s top 10 for beds delivered both in 2018 and also over the course of the cycle, which began in 2011. Florida State University and Texas A&M University were the clear-cut leaders for total beds delivered in 2018. Florida State’s 2,700-plus beds ranked as the third largest annual total at any university since 2011. Meanwhile, Texas A&M’s 2,487 new beds last year ranked as the seventh largest total over the cycle. In 2019, overlap among the top 15 universities for new supply appears minimal, as only two schools from 2018’s top 15– Florida State University and the University of Texas at Austin – will make the list again. Purdue University ranking as the nation’s #1 university for total beds delivering in 2019 may come as a surprise. 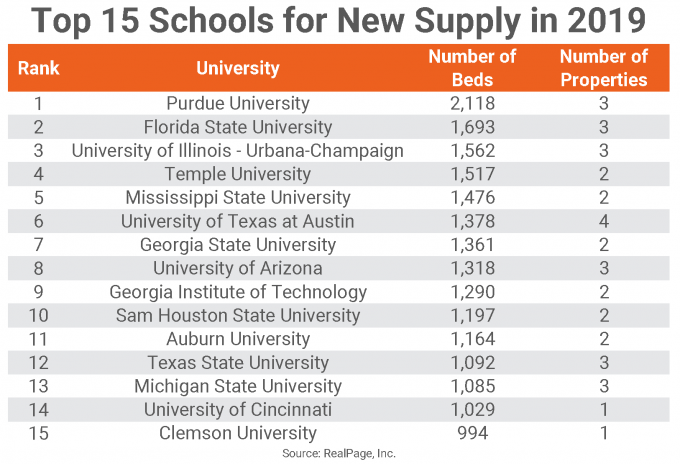 Purdue’s previous highest total delivery volume was a comparatively meager 764 beds, which ranked just 29th highest among the 73 U.S. universities receiving supply that year. But the Indiana school will be the only one in the nation to receive more than 2,000 units this year. At #2, Florida State University is no stranger to construction this cycle. In fact, Florida State ranks second nationally – behind Texas A&M – when stacking up total deliveries (10,530 beds) since 2011. Almost 1,700 beds are set to deliver at the Tallahassee campus in 2019. 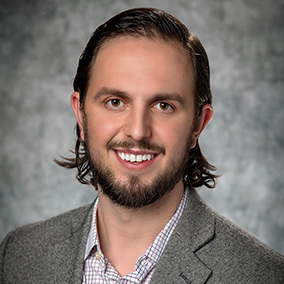 While many of 2019’s projected supply leaders are in true “college towns” where the university itself is the key economic anchor, Temple University and the University of Texas at Austin are intriguing inclusions, considering the urban location of these two schools. In the case of the University of Texas at Austin, the expected delivery of 1,378 beds in 2019 is not out of line with delivery volumes from recent years. Both 2013 and 2018 saw more than that total delivered, while 1,300 beds were brought to market in 2014. 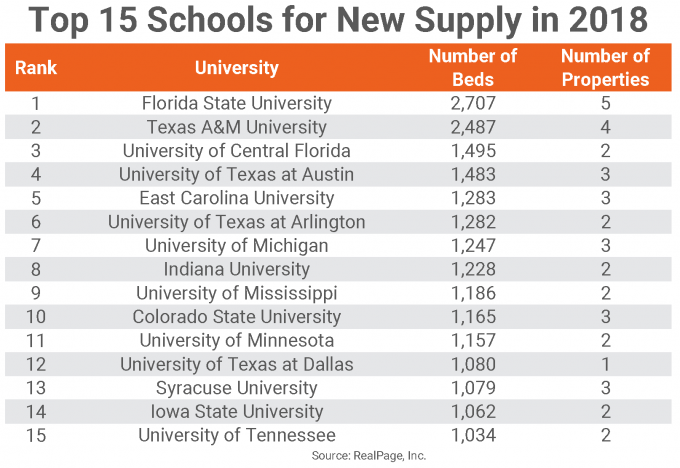 UT Austin has received a total of 6,271 new beds since 2011, the eighth most nationally. At Temple University, on the other hand, the 1,517 beds slated to deliver in 2019 exceeds the total number of beds delivered over the course of the eight-year cycle. This year’s expected supply nearly doubles the university’s previous high (834 beds) from 2014 and promises to test the market’s ability to absorb that much new product. The locations of both Temple and the University of Texas in Philadelphia and Austin, respectively, also means that the composition of oncoming supply is notably different than what is commonly found in other university markets. New construction at these schools is largely mid-rise or high-rise product. At Temple, the two properties set to deliver in 2019 stand 18 stories. By comparison, the three properties delivered since 2011 have been four, five and 14 stories. Even more remarkable is the density of product delivering at the University of Texas at Austin. The properties scheduled to deliver this year feature two seven-story communities and one 18-story building.